A large number of subjects dealt with in the Bible are also found in the Qur'an. Firstly, there are narrations referring to the Prophets; Noah, Abraham, Joseph, Elias, Jonah, Job and Moses; the Kings of Israel; Saul, David, Solomon-to name just some of the main narrations they share in common. There then follow more specific accounts of great events in the course of which the supernatural has intervened, e.g. the Creation of the Earth and Heavens, the Creation of Man, the Flood, the Exodus. Finally, there is all that has to do with Jesus and His mother Mary as far as it concerns the New Testament. What reflections do the subjects dealt with in the two Scriptures provoke when viewed in the light of our modern knowledge of them from extra-Scriptural sources? Parallel: Qur'an/Gospel and Modem Knowledge. With regard to the parallel of Qur'an/Gospels, one must first note that none of the subjects referred to in the Gospels, which were criticized from a scientific point of view (see Part Two of this book), is quoted in the Qur'an. Jesus is referred to many times in the Qur' an, e.g. Mary's annunciation of the nativity to his father, the annunciation of the miraculous nativity to Mary, Jesus's stature as a Prophet of the highest order, His role as a Messiah, the Revelation He directs to Man which confirms and modifies the Torah, His preachings, His disciples and apostles, the miracles, His Ascension to God, His role in the Last Judgment, etc. Suras 3 and 19 of the Qur'an (the second of which bears Mary's name) devote long passages to Jesus's family. They describe His mother Mary's nativity, her youth and the annunciation of her miraculous motherhood. Jesus is always called 'Son of Mary'. His ancestry is exclusively given with regard to His mother's side, which is quite logical since Jesus had no biological father. Here the Qur'an differs from Matthew's and Luke's Gospels: as we have already seen, they give the paternal genealogies of Jesus which are, moreover, different from each other. "God chose Adam, Noah, the family of Abraham and the family of Imran above all His creatures, as descendants one from another." So Jesus is descended from Noah and Abraham on His mother Mary's side, and from her father Imran. The errors made in the naming of the 'ancestors of Jesus' found in the Gospels are not present in the Qur'an, nor are the impossibilities in the genealogies contained in the Old Testament of Abraham's ancestry, both of which were examined in the first and second parts of this book. Once again, this fact must be noted if one is to be objective, and yet again its great importance appears very clearly in the face of the unfounded statements which are made claiming that Muhammad, the author of the Qur'an, largely copied the Bible. One wonders in that case who or what reason compelled him to avoid copying the passages the Bible contains on Jesus's ancestry, and to insert at this point in the Qur'an the corrections that put his text above any criticism from modern knowledge. The Gospels and Old Testament texts are quite the opposite; from this point of view they are totally unacceptable. 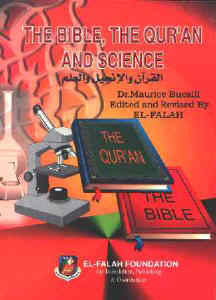 Parallel: Qur'an/ Old Testament and Modem Knowledge. In the case of the Old Testament, certain aspects of this parallel have already been dealt with. The Creation of the world, for example, was the subject of a critical study made in the Old Testament section of this book. The same subject was examined with regard to the Qur'anic Revelation. Comparisons were made and there is no need to cover this ground again. It seems that historical knowledge is too vague and archaeological data too scarce for parallels to be established in the light of modern knowledge on problems concerning the Kings of Israel, who form the subject of narrations in both the Qur'an and the Bible. Whether or not one can tackle the problem of the Prophets in the light of modern data depends on the extent to which the events described have left traces which may or may not have come down to us. --The first because it has not left traces in the history of civilization which support the Biblical narration, whereas modern data do not permit us to criticize the narration contained in the Qur'an. --The second because the Biblical and Qur'anic narrations evidently complement each other in their broad outlines, and modern data seem to provide both of them with remarkable historical support.